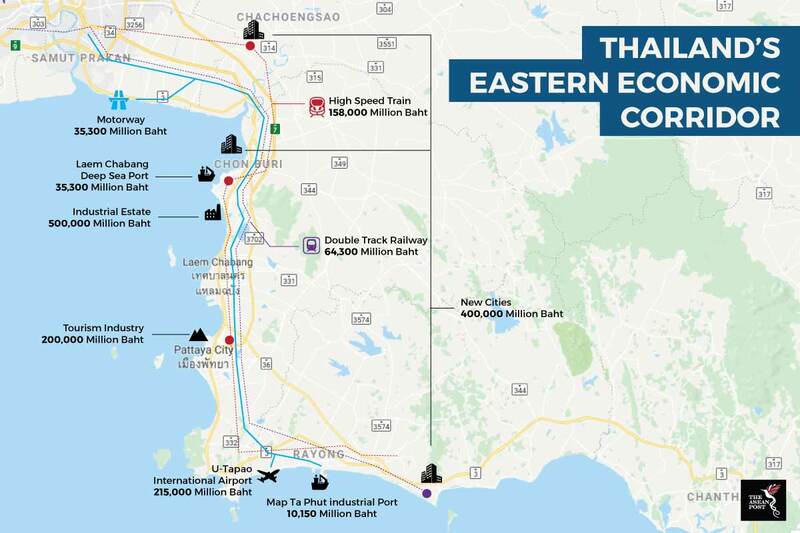 Thailand’s Eastern Economic Corridor (EEC) is slated to be an arterial node for trade, investment, and regional transportation, besides also serving as a strategic gateway to the Southeast Asian region. Stretching a total area of 13,000 square kilometres – encompassing the eastern provinces of Rayong, Chonburi and Chachoengsao – it is part of the government’s wider Thailand 4.0 plan to transform the Thai economy into Southeast Asia’s engine of growth. The EEC is slated to attract approximately US$46 billion in investments focussed on "S-curve” industries – namely, next generation automotive, aviation and logistics, smart electronics, medical tourism, food, robotics, agriculture and biotechnology. Recently, 18 companies from Thailand and elsewhere have expressed interest in bidding for US$1.7 billion worth of contracts to expand the Map Thaput deep sea port. The investors include Thailand’s own PTT Global Chemical, Ratchaburi Electricity Generating Holding as well as foreign companies like Boskalis International and China Communication Construction. The project is one of five mega projects slated for the EEC located near the country’s famed tourist destination, Pattaya along the eastern coast of the Gulf of Thailand. Spanning an area of nearly 435 acres, it aims to support the expansion of the Thai petrochemical industry. Thai authorities should finalise the winning contract bidder by February next year as construction is due to be completed by 2024. As of April this year, 259 direct investments in the EEC region totalling close to US$10 billion have been approved with 133 projects in Chonburi valued at US$3.76 billion, 93 projects in Rayong valued at US$5.22 billion and 33 projects in Chachoengsao valued at US$970 million. Another project within the EEC pipeline is the expansion of the Laem Chabang port, just north of Pattaya City. According to the Port Authority of Thailand, 32 firms including 17 Thai firms and 15 foreign firms have prepared bidding documents for the project. The port’s expansion will see two additional piers for cargo ships. However, recent global developments with regards to the US-China trade war and increasingly wary investor sentiments may hamper Thailand’s largesse infrastructure plans. The Thai government has been actively promoting the EEC investment opportunities in roadshows which are aimed to retain and improve foreign investor confidence. To further attract investors, the Thai government has relaxed certain laws and regulations to facilitate and encourage foreign investors looking to invest in the EEC’s initiatives. These include, zero percent corporate income tax for up to 15 years, exemption from existing foreign land ownership restrictions, long-term land lease agreements up to 99 years for commercial and industrial areas, five-year business visas, and a personal income tax rate cap at 15 percent. On top of that, Thailand is doubling down on its intentions to bolster capacity building for next generation technologies like robotics, automation, smart electronics and biofuels. The Industrial Estate Authority of Thailand (IEAT) is mandated with assisting in the development of such technologies for the EEC in line with the country’s Thailand 4.0 digital agenda. Thailand 4.0 is an economic model introduced to free the country from dependence on traditional agriculture which has been the cornerstone of previous economic models. The four objectives of the model include improving economic prosperity, social wellbeing, environmental standards and human values. The IEAT has since established a Smart Park Industrial Estate to improve digital industries and modern lifestyle. The park is fully equipped with high-speed internet specialities a large data centre as well as a state-of-the-art security system in order to maximise the fullest digital potential of relevant industries. Thailand’s EEC plans come at a timely juncture. Following current global economic sentiments, the country is expected to witness dwindling exports over the next to years which could slowdown its economy. But, with the EEC taking off within the same time period, the negative effect of this can be negated, thus heralding a rosier economic outlook for the kingdom.